Eeboo’s whimsical design and learning-through-fun activities (including other Inhabitotsfavorites like their nesting blocks) are supported by lots of green cred: the small, family run business uses simple materials which are often recycled and colored with non-toxic inks, and consistently exceed safety standards. But their products are not just for kids – you can fill up those extra post-dinner hours of sunlight with a family board game. Eeboo’s games are printed using soy inks and do not include any plastic. Plus, the eco-friendly messages continue into the themes of the games themselves. Gathering a Garden, made like the other games from 75% recycled materials, is a fun way to get kids excited about gardening. 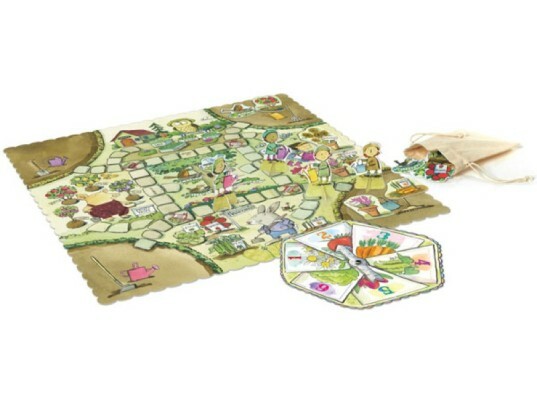 Each child (or parent) tries to create a complete garden by getting one item from each category around the board (which includes birds, herbs, flowers, vegetables and fruit trees). The charming gardeners and garden creatures also comes with a cotton pouch for safe keeping. In Robot Explorers, players race around the solar system to eight planets, picking up specimens for their science lab and avoiding rockets and asteroids. Finally, Slips and Ladders is a version of the childhood favorite Shoots and Ladders, with a green makeover. For ages 5+. Eeboo�s whimsical design and learning-through-fun activities (including other Inhabitotsfavorites like their�nesting blocks) are supported by lots of green cred: the small, family run business uses simple materials which are often recycled and colored with non-toxic inks, and consistently exceed safety standards. But their products are not just for kids - you can fill up those extra post-dinner hours of sunlight with a family board game. Eeboo's games are printed using soy inks and do not include any plastic. Plus, the eco-friendly messages continue into the themes of the games themselves.